Fall is one of the best times to up your curb appeal and create a welcoming yard and garden for all your family and friends. Updating your fall planters and containers for fall is easy, can be done in an afternoon, and can last well into the holiday season. Fall creates a whole new gardening personality… one that is more laid back and sleepy, but also electrified with color and texture. It’s almost as if Mother Nature wants one last dip in the pool before the summer sun sets for the cold winter. And she brings the margarita mix. Gotta love that. 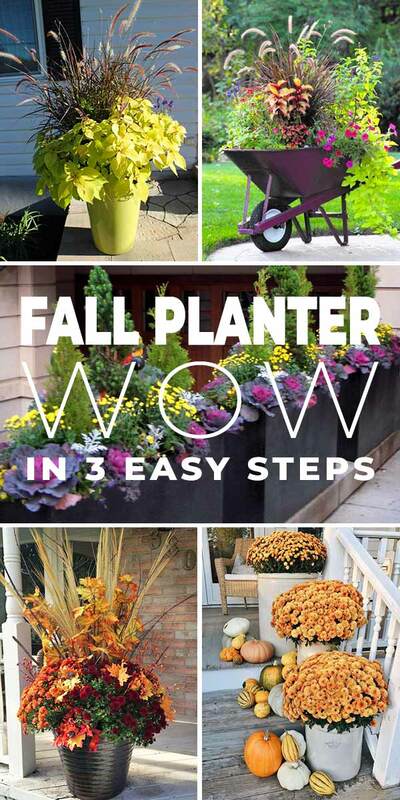 Learn how to create fall planter wow in three easy steps! When your fall containers get tired, nothing perks them up like a fresh foliage plant. Adding a foliage plant to help the eye “rest” is key in this season where everything can look busy. Foliage will also carry farther into the colder weather, extending your containers’ season. Our favs? Ornamental Kale is always a winner, but so are various types of ivy, lamium, and dusty miller. 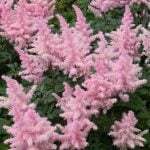 If you grow lambs ear (or any other foliage perennial for that matter) in the garden, now is a great time to divide it and plant some divisions in your pots. 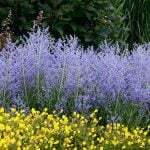 Hardy herbs can also be a great idea at this time of year. You may have some plants from the earlier season that can stay in place and contribute here too… don’t be too quick to boot out a plant just because it isn’t flowering. 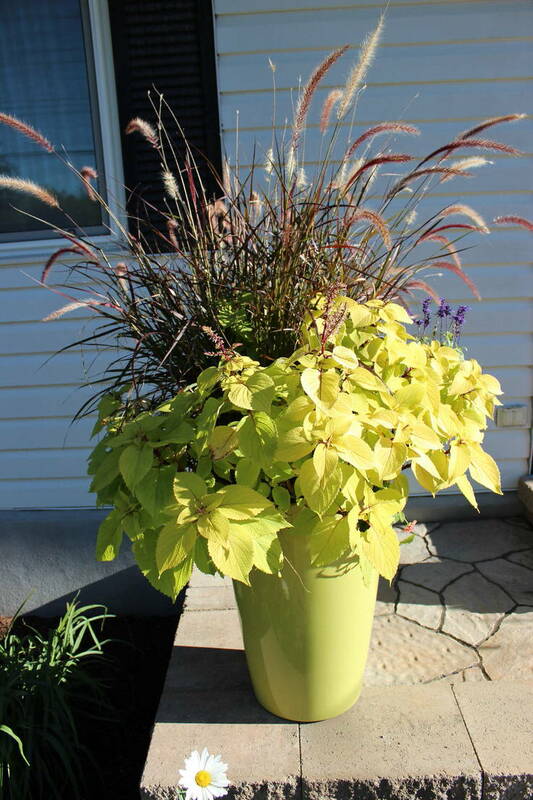 This fall container idea from ‘Houzz‘ uses just foliage. But notice you still get texture and color! This is purple fountain grass and Coleus. 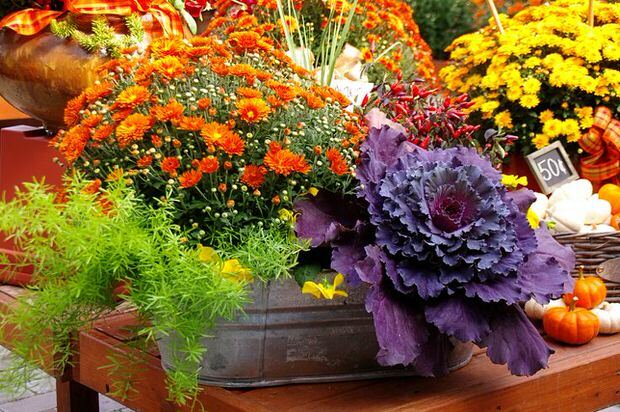 Add filler flowers to your fall planter. This is where you add the sparkle! Pop in some festive fall annuals here, mums, pansies, asters, zinnias. You don’t need a bunch here, just choose one or two you love! And don’t skimp. Your fall plants won’t have much growing time to fill in, so tuck them pretty close together to give them a designer look. 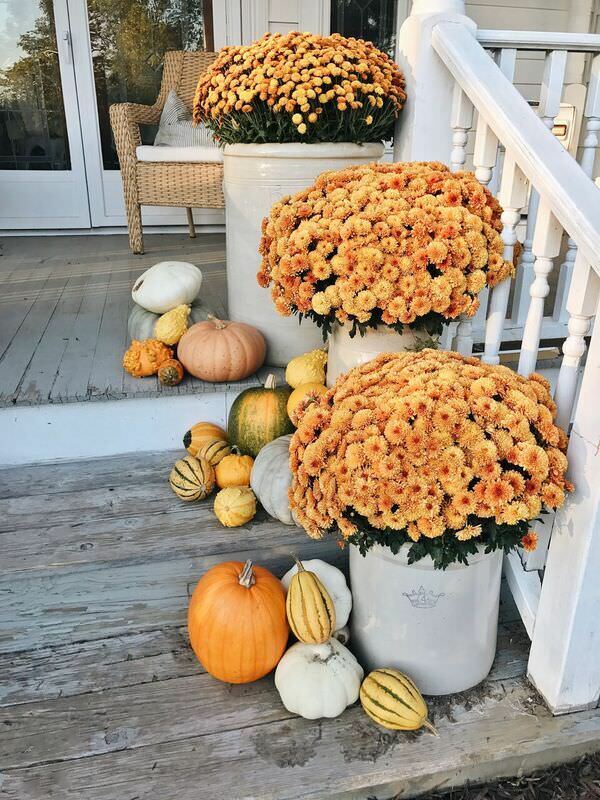 This time of year, you can either choose to stay with one or two colors for a calmer color scheme, or go all out and make it a fall planter fiesta. You can even stay with an all foliage container by using colored foliage as your filler “flowers’. From ‘Momcrieff‘, this is a great example of using filler flowers… and some are cut flowers! What a great combo in this planter idea. 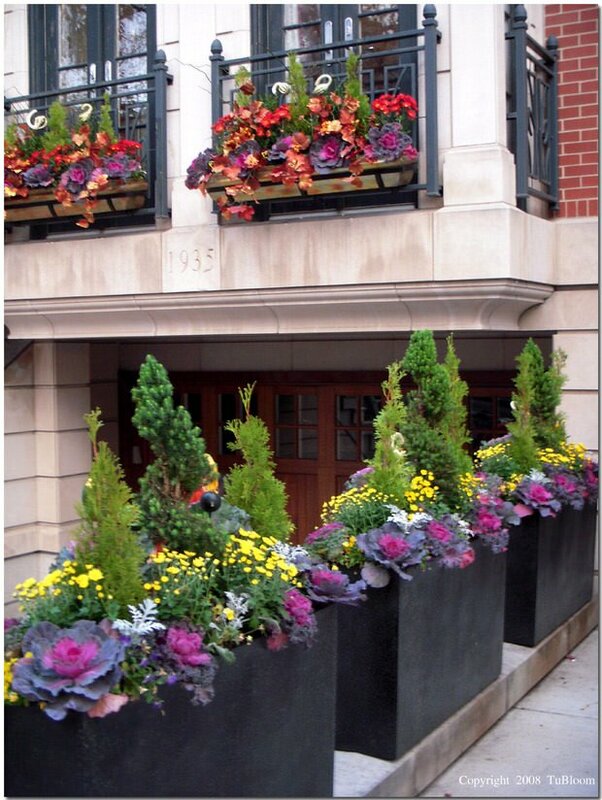 These are evergreen planter boxes that are updated each season with filler flowers. Mums and Kale fit the bill here. Photo by ‘Tubloom‘. 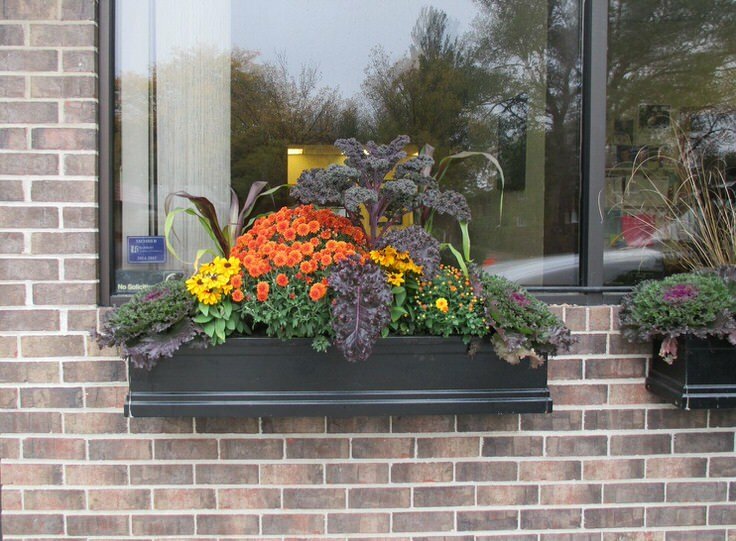 You can make a fall planter window box using these same steps too! Photo by ‘Houzz‘. 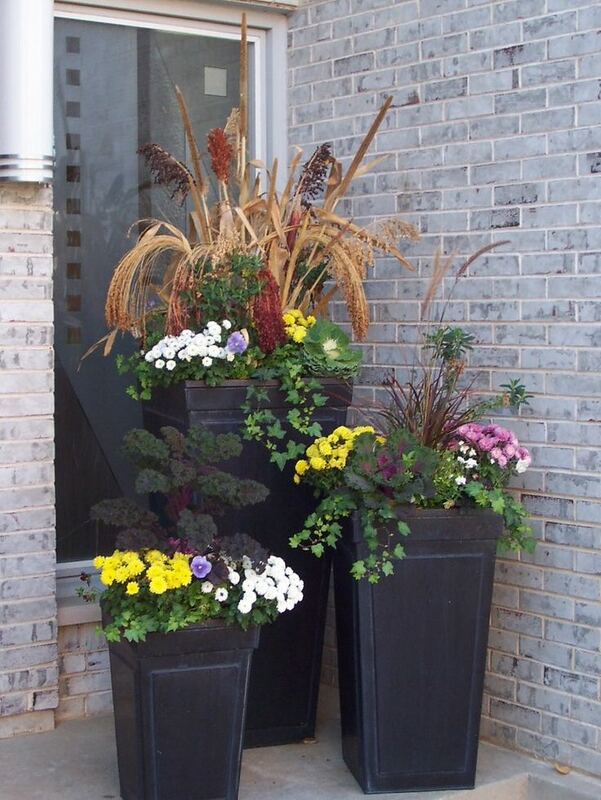 These contemporary containers from ‘Houzz‘ show the use of foliage and filler flowers to make these come alive for the whole season! Read on about why those corn stalks are so important too. Add texture with fall plants. 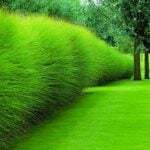 Ornamental grasses are a great bargain this time of year, and are usually on clearance. Pick up a few container size varieties to add texture, height and structure to your fall container garden. 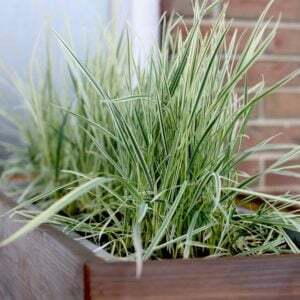 Make sure you plant the taller grasses in the back of the container. Another option is to use branches and berries to add fall planter texture. 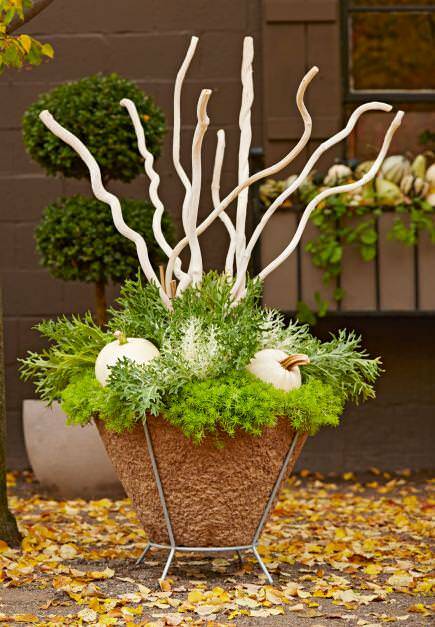 This example uses texture and form with these white branches and mini pumpkins. From ‘Midwest Living‘. 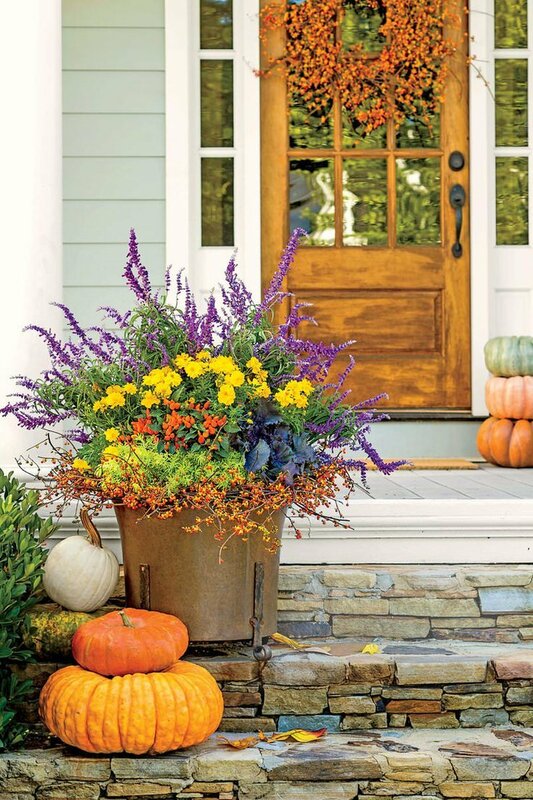 If you really love the whole autumn colors vibe for your fall front porch decor, this container garden is perfect inspiration! 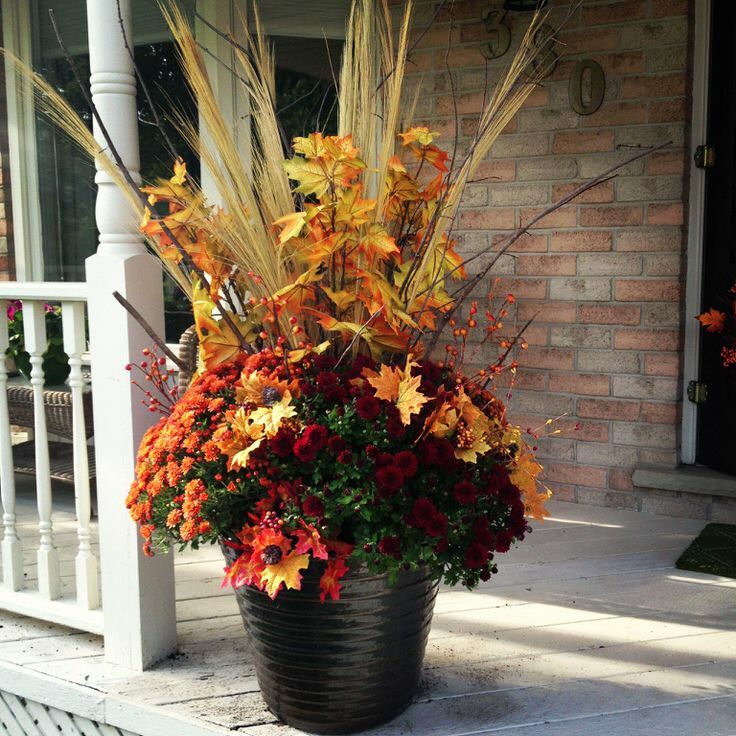 The branches of fall leaves and the dried grasses really do add color and texture to an already fiery fall planter! 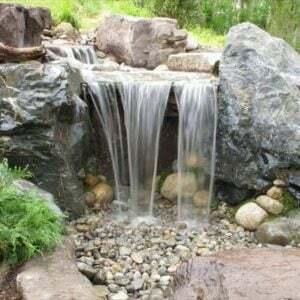 Photo from ‘Pinterest’. 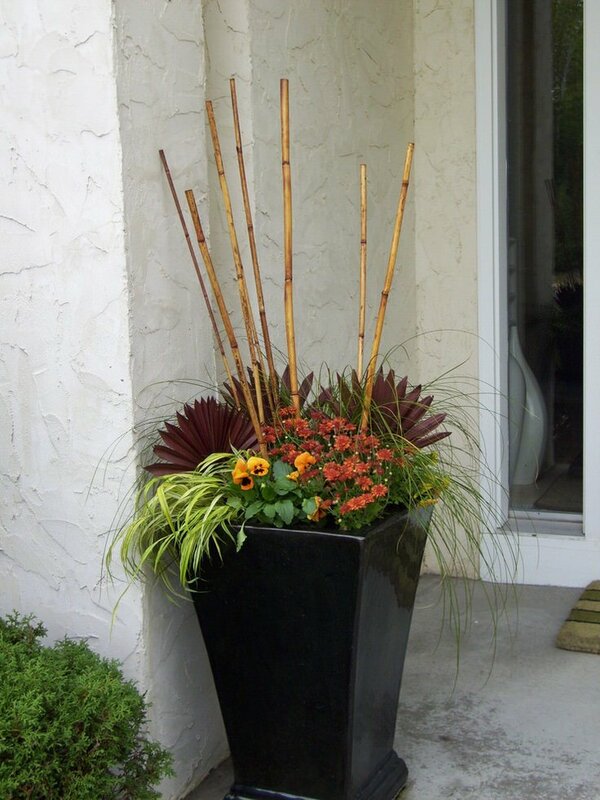 From ‘Houzz‘, another example of adding texture to your fall containers, this time using bamboo stakes. 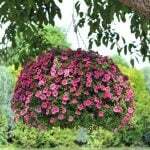 You will need to clean out the old summer annuals from your container gardens. Pull out a few new containers if the budget allows. This is a great time of year for re-purposed containers as well… a planted wheelbarrow or old tin buckets just hints at the hard work that went into the garden harvest! ‘Liz Marie‘ planted her fall mums in old crockery for her front porch. 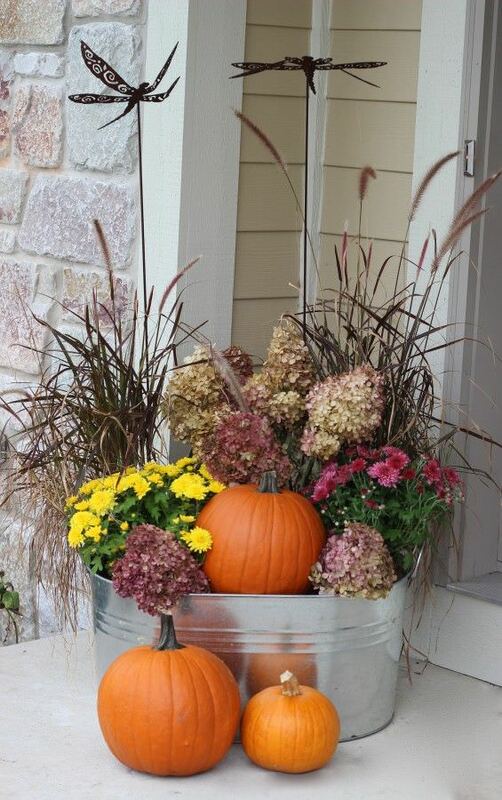 The pumpkins add the texture to make this a really festive fall planter idea! 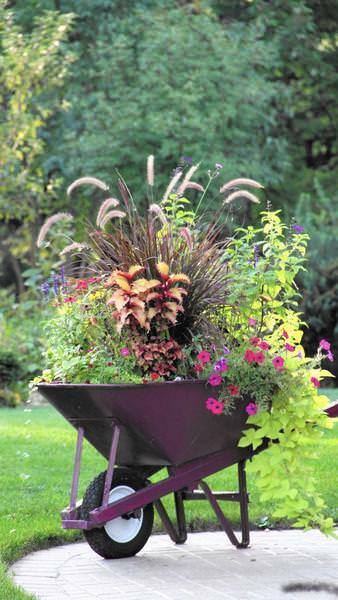 This wheelbarrow planter photo is by Nina Koziol / Chicago Tribune. Love the texture the purple Kale gives to this bright fall container. 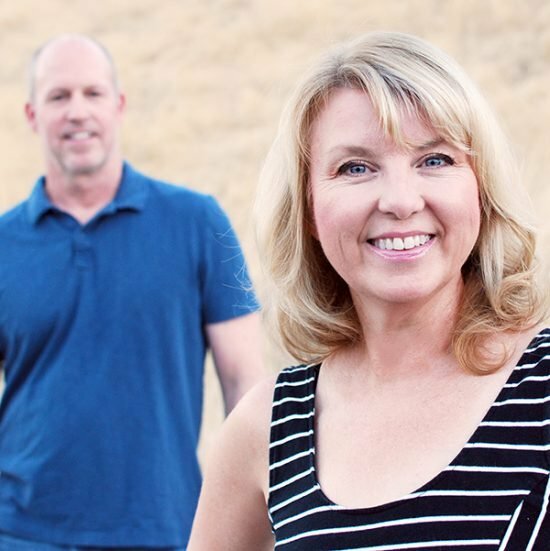 Photo by ‘McCabe’s‘. When cleaning out the the old plants, don’t be shy about getting those packed in roots out of there. Use a sharp knife if necessary. Add additional fresh soil when you place the new plants into the container gardens, and pack lightly. Water. What’s your opinion? 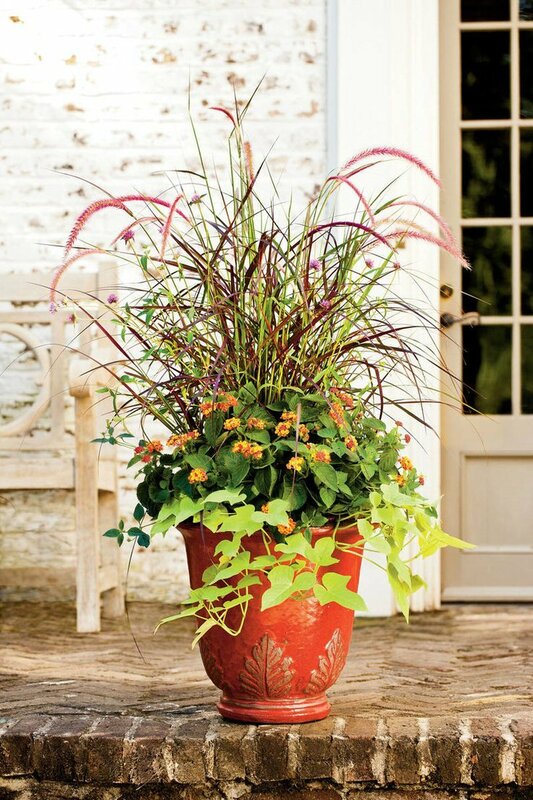 Can’t wait to decorate the yard with fall planter ideas, and usher in those holiday festivities with style? Or do you think its a waste of time… those flowers are just going to die anyway? (We’re hoping you pick the first one!) We think you will also love our posts on Fabulous Fall Container Ideas and How to Make Winter Garden Planters! I must admit that here in Australia we don’t go all out in autumn (fall) probably because this time of year is usually mild and we tend to rejuvenate our gardens and clean up around the yard this March though I will plant up a number of containers to make the most of the season so, thanks for your ideas – great work. Do you know what the large wooden container, on the green porch, is in the fourth photo? Love it and thank you. Im sorry Joanne, we don’t! Good luck in finding (or making) one like it! It looks to me to be an old cupboard and they set the plant on the top. Great pics! Do you know what the name of the paint color used on the green house color is in the photo? Thanks!